Visit Sierra Trading Post online at SierraTradingPost.com as your first and only choice for outdoor clothing and equipment. Sierra Trading Post purchases name-brand overstocks and closeouts and passes savings on to its customers — selling dress, casual and outdoor clothing, footwear, home furnishings, accessories, and gear at savings of 35-70%. Save even more with Sierra Trading Post discounts, Sierra Trading Post coupons and Sierra Trading Post savings from 58Coupons.com. Hurry on over to SierraTradingPost.com to save 25% on orders of $150 with this coupon code. Use Sierra Trading Post Rewards Visa Platinum Card online at SierraTradingPost.com. Earn points, rewards, and free shipping with no annual fee. Save 30% to 70% on High Performance Gear at sierratradingpost.com. Save 60% on retail price in the Bargain Barn at sierratradingpost.com. 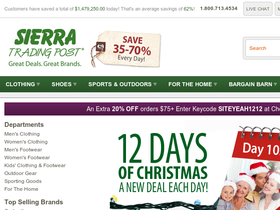 Head on over to Sierra Trading Post to save 20%of purchases of $100 or more with this coupon code.